It's hard to deny that Utah has some of the best riding in the United States, so picking just one spot to ride can be a bit of a challenge. 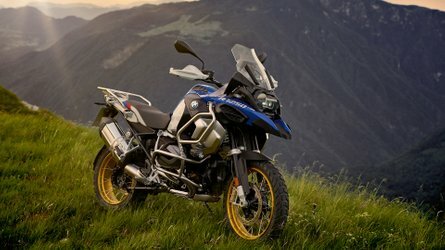 For those who haven't ridden through the Beehive State (yes, that is really their official nickname) you might have images of dusty expanses that can only be conquered by a fully kitted out BMW R 1200 GS. While there are plenty of parts that can only be reached on a serious off-road machine, there are still thousands of miles of paved roads for those of us who like to stay on the blacktop. 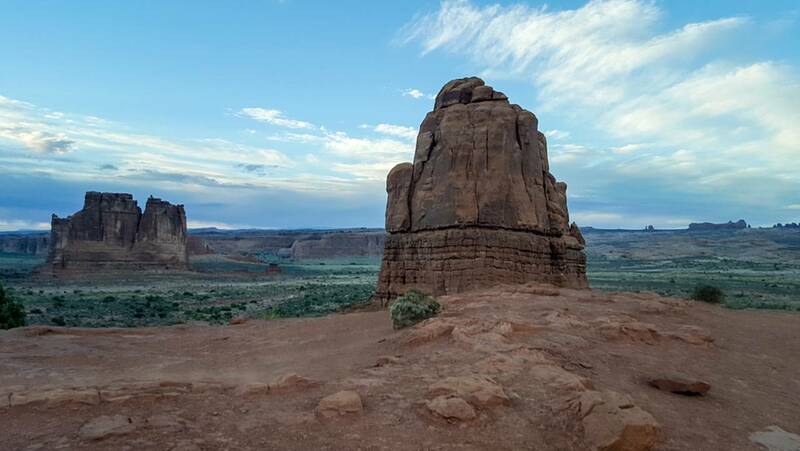 Just north of the city of Moab you'll find Arches National Park, which has some of the most breathtaking rock formations that you'll find anywhere in the continental United States. 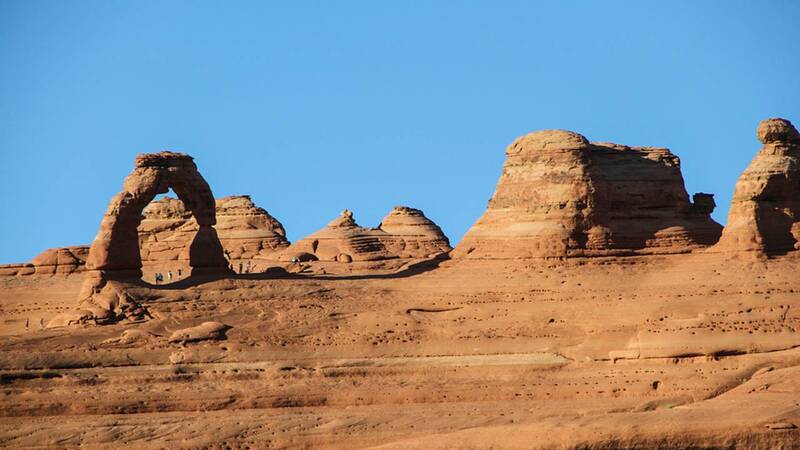 No trip to Utah is complete without visiting this park and it is impressive enough to warrant a trip just to check it out. Mandatory photo at the park entrance. The entire park sits atop a massive layer of salt (thousands of feet thick in some places) which is the remnant of an inland sea that dried out some 65 million years ago. Over millions of years, debris was deposited on top of the salt layer forming a layer of sandstone. Eventually these layers were thrust upward by various geological processes (salt makes for an unstable base layer) and then spent millions of years being eroded into the shapes we see today. The park boasts more than 2,000 natural stone arches as well as hundreds of stone pinnacles, fins, and balanced rocks. 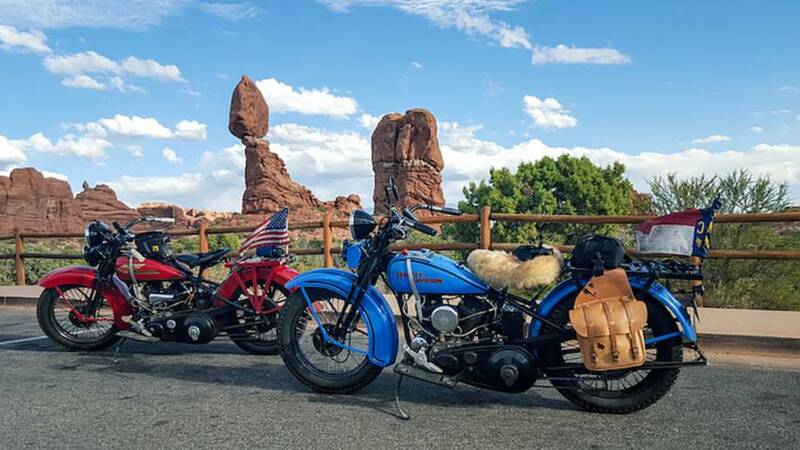 After you enter the park (entrance fees are $15 per motorcycle), the first thing you are going to do is start to climb. The park elevations range from 4,000 to 5,600 feet. It's not in the clouds, but there are some steep uphill and downhill grades. 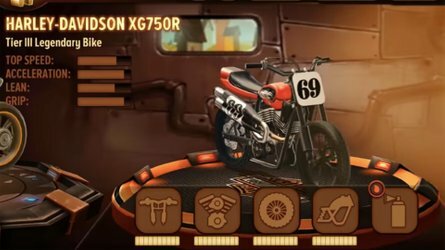 You'll hit a couple tight switchbacks at the beginning, which are easy enough on a motorcycle, but do keep an eye out for rental RVs crossing the double line as their drivers navigate tight curves for the first time. 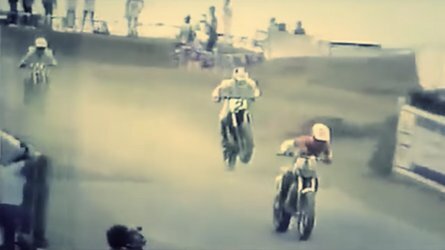 Luckily, this section is fairly short and in a few miles things will start to straighten out to easier curves and you'll only need to keep an eye out for vehicles pulling out from the various overlooks. It is good to keep in mind that with all the natural wonders just off the side of the road most people (including yourself) are not always going to be looking out for other road users. 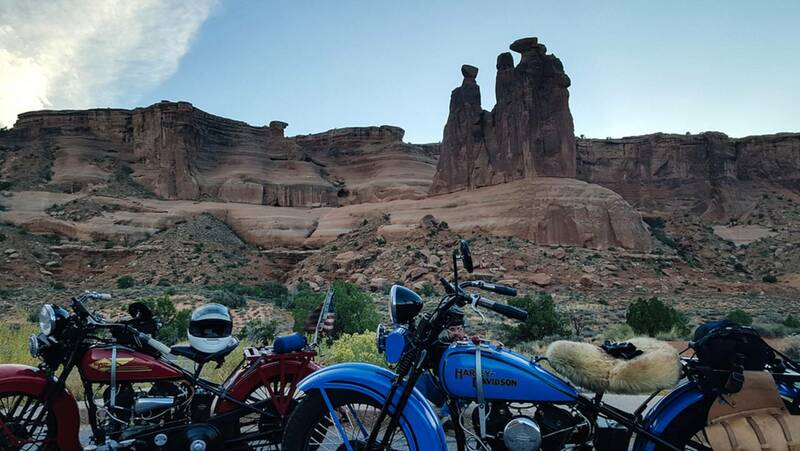 The park is loaded with scenic overlooks that look even better with a couple of motorcycles in the frame. The first noteworthy formation inside the park is called Park Place. It is basically just a small one-mile-long canyon with a hiking trail along its floor. If you have a passenger with you, they can hike the short trail and you can pick them up at the other end, as the main road wraps around the canyon. Unless you just really have to hike everything, you can see all of the canyon just by stopping at both ends. You can just make out a group of hikers heading down the center of Park Place. At the other end of Park Place is the Courthouse Towers viewpoint, so you can catch the end of the canyon and another nice formation with just one stop. Now it's time turn off the main road and take a short side trip through the Windows Section. 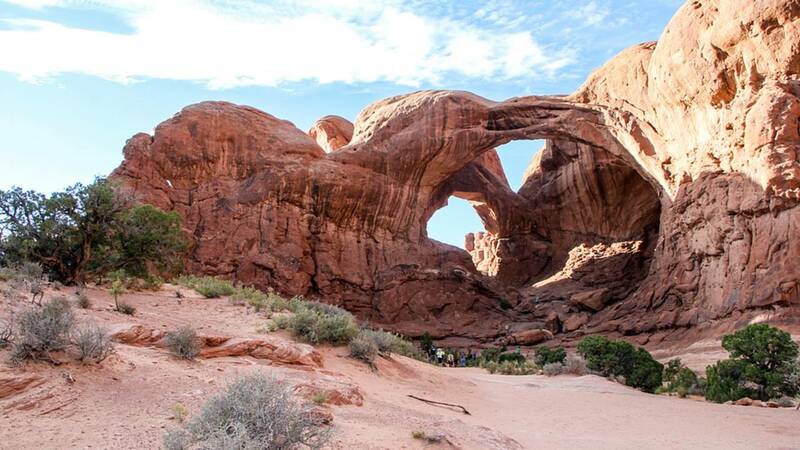 It's a short detour and it takes you to some of the park's largest arches. If you've got an extra half hour to spare, you can also hike under either the Double Arches or the North Arch, which is well worth the extra 30 minutes. 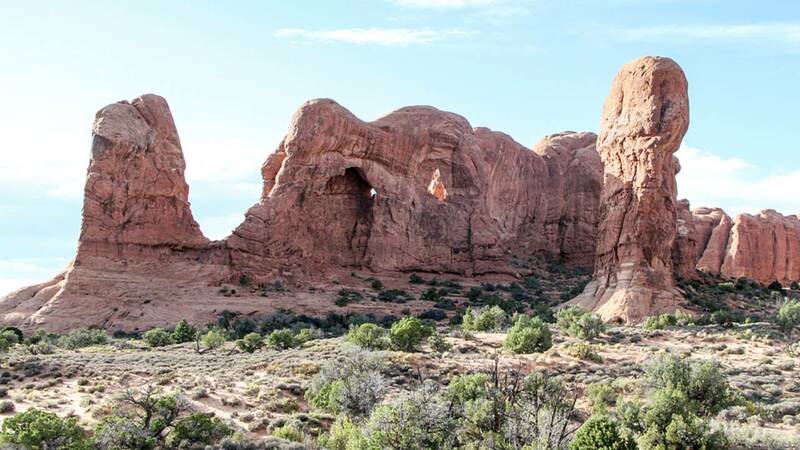 Don't worry about packing hiking boots either, the walk to these arches is just a wide, sandy trail. Once you are back on the main road it's only a few miles to the next detour, which will take you to the park's most famous feature: Delicate Arch. 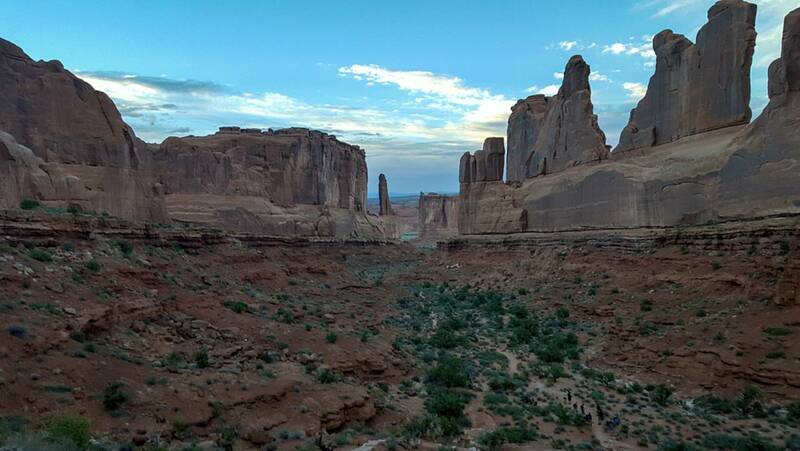 You can hike all the way to the arch if you are ready for 3 miles round trip on what the park service calls a "difficult" trail, or you can still see plenty of arch just by riding down to the overlooks. Of the two overlooks, one is basically right next to the parking lot and the other is a half mile hike up a rocky trail. I made it to both in my riding boots without any issues, so don't let terms like "moderately strenuous" on the map keep you from checking it out. After you get back from viewing the Delicate Arch, you have a couple of options. There are ranger-led hikes of the Fiery Furnace, which is a section of narrow canyons and requires paying an extra fee. There are also a number of other arches that you can go check out, but these all require more substantial hikes of a few miles, at least. The park is open 24 hours, so you can beat the heat and cruise at sunset. Camping is available right inside the park, too, but I recommend staying just outside the park in Moab. There is a nice KOA outside of town and it is within walking distance to at least a handful of restaurants if you didn't get in enough hiking while at the park. 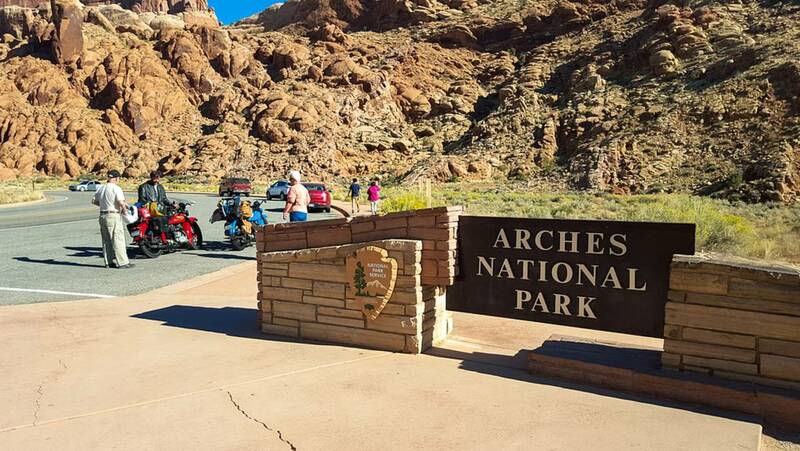 The Arches National Park is open 364 days a year (only closed on Christmas), so planning a trip that fits within your schedule shouldn't be a problem. 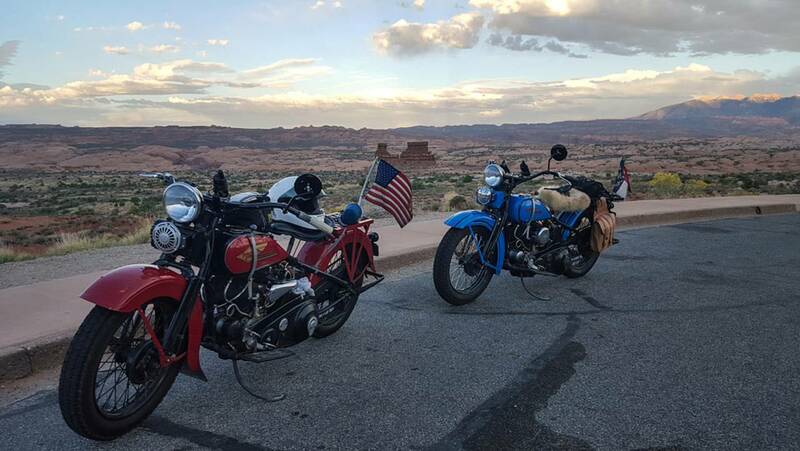 It is important to note that the Arches is not the only place worth visiting near Moab, the Canyonlands National Park and Hovenweep National Monument are both worth visiting, as well. The Arches take on a whole new look every afternoon at sunset. 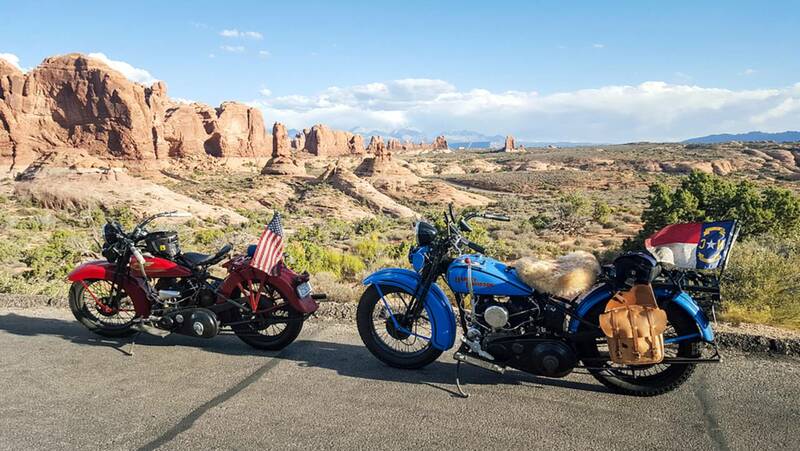 If you find yourself riding through Utah or if you need an excuse to visit, then checking out the Arches National Park makes for a great day of riding. 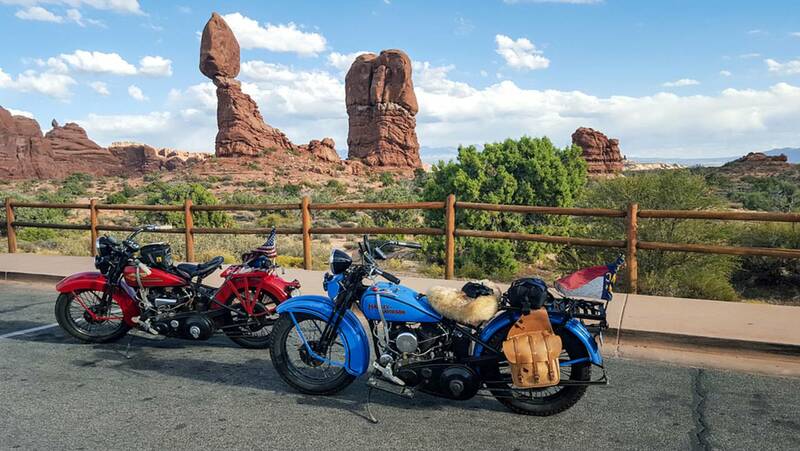 Whether you just want to observe from the back of your bike or get off and do some serious hiking, the Arches will not disappoint. The variation in terrains means there is something unique around almost every bend in the road and even if you are not a geology buff you'll still be able to appreciate the grandeur of the park. Being from the East Coast, I was captivated by the alien landscape that reminded me more of pictures from Mars than something I expected to find in the United States. 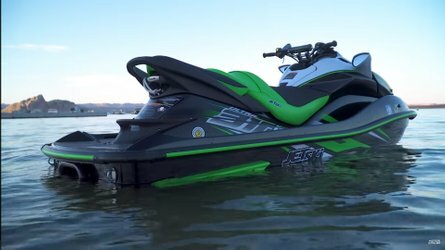 It may be too late to plan a ride to Utah this season, but you have all winter to figure it out.